How Do Antibiotics Promote Growth in Poultry? 2 July 2014, at 4:14p.m. US - Two respected poultry veterinarians share their insights into the mode of action of antibiotics in the feed in 'Poultry Health Today' from Zoetis. Under the new FDA guidelines, in-feed antibiotics with FDA-approved performance claims can still be used to promote growth and improve feed efficiency — as long as they are not considered “medically important” to humans. That is good news for efficiency-minded poultry producers looking to meet escalating world demand for healthy, safe and affordable chicken and turkey. Still, the words “growth promotion” and the role these antibiotics play in poultry production are often misinterpreted by those outside of production. For example, one non-medically important poultry antibiotic that will retain its FDA-approved performance claims is bacitracin methylene disalicylate (BMD®). The product is indicated for “increased rate of weight gain and improved feed efficiency” in both broilers and turkeys when used at the rate of up to 50g per ton of feed. Coincidentally, BMD is also labeled for broilers at the rate of 50g per ton for the prevention of necrotic enteritis caused or complicated by Clostridium spp. and other organisms susceptible to the product’s active ingredient. That begs the question, does the antibiotic simply make birds grow — or is improved performance really secondary to improved health that enables birds to reach their full genetic potential? “The term growth promotion in itself is accurate but may be a bit of a misnomer,” says Steven Clark, DVM, senior poultry technical services veterinarian, Zoetis Inc.
For a long time, it has been thought that subtherapeutic doses of in-feed antibiotics enhance growth by modifying intestinal microflora, although exactly how isn’t known for sure and is still up for discussion, he says. Another theory emerged in 2007 with publication of a paper entitled 'The Nonantibiotic Anti-Inflammatory Effect of Antimicrobial Growth Promoters, the Real Mode of Action? A Hypothesis.' The author argued that most antibiotics have a non-antibiotic, anti-inflammatory effect, which may in turn reduce wasted energy and spare it for production. This theory would also explain why results with so-called growth-promoting antibiotics are highly reproducible, as opposed to those obtained by antibiotic alternatives that are aimed at microflora management, Professor Niewold wrote. 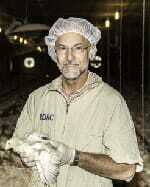 However they work, their benefits are well known to those involved in poultry production. “Today, we know that one of the primary mechanisms of action these antibiotics have in poultry is preventing subclinical necrotic enteritis caused by Clostridium perfringens,” says Charles Hofacre, DVM, MAM, PhD, University of Georgia. This is particularly evident in flocks that for one reason or another are experiencing greater stress and, as a result, a greater disruption in their intestinal bacterial flora. Dr Clark agrees that antibiotics with performance claims are especially helpful for flocks in stressful situations, provided they are used judiciously. Drs Hofacre and Clark see other secondary benefits from their use. By improving feed efficiency, consumers get the same amount of meat without requiring as much corn and soybeans for growth. That means more grain for other uses, Dr Hofacre added. Poultry Science Association. 2007. Newly proposed mechanism for the action of antimicrobial growth promoters (AGPs) may open the door to the development of new non-antibiotic alternatives to AGPs. Press release. Roura E. et al. 1992. Prevention of immunologic stress contributes to the growth-permitting ability of dietary antibiotics in chicks. J. Nutr. 122:2383-2390. Niewold T.A. 2007. The nonantibiotics anti-inflammatory effect of antimicrobial growth promoters, the real mode of action? A hypothesis. Poult. Sci. 86(4).